Shipping container houses are modified used shipping containers attached together to build a home. With proper planning, you can manage to obtain a luxurious house for half the price of normal construction. There are two standard sizes for shipping containers: 20 x 8 x 8 ft. covering a surface of 160 sq. ft. and 40 x 8 x 8 with a surface of 320 sq. ft. A used 20-footer costs anywhere between $1,400 and $2,800 whereas a 40-footer costs $3,500 – $4,500. You will also have to pay for labor (about $50-$150 per hour) and for the modifications needed to make the container livable. Expect to pay at least $10,000 for labor, more likely $15,000. It’s important to note that in many cases it may be necessary to provide a site plan to obtain various home building permits from your city hall or township. You can get a custom site plan drawing prepared for your dream home in less than 24h hours by our team of experienced architects and drafters. Use the promotion code: 24hplans-20off to get a 20% discount off any package. — Please note this is a limited time offer, exclusive to the readers of our blog. This offer is not being advertised anywhere else. 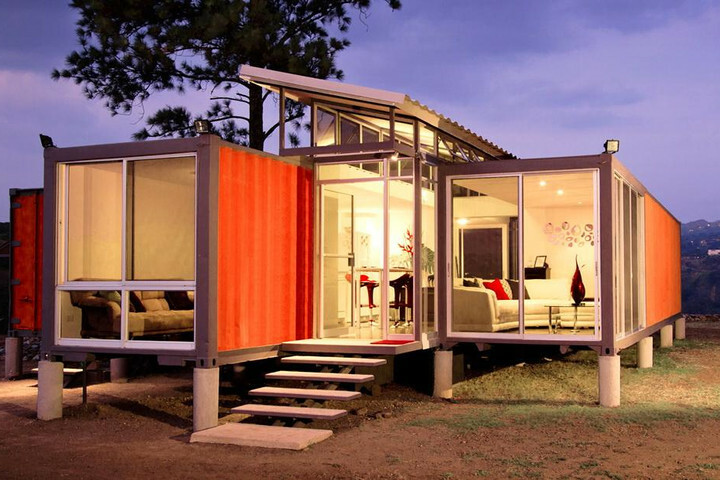 There are prefabricated shipping container houses sold for as little as $15,000. 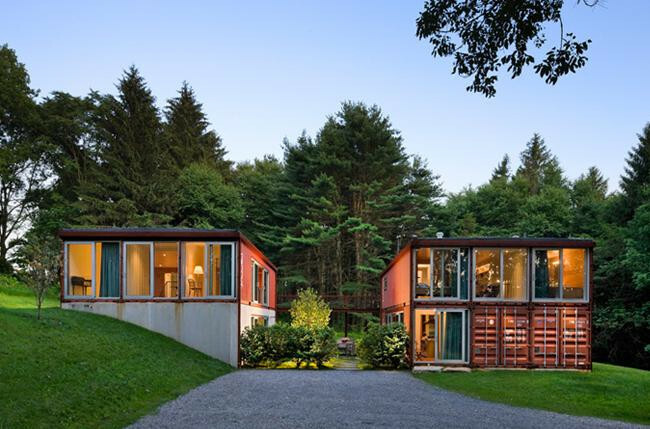 A big and luxurious house made of shipping containers can cost more than $200,000, but this is one half of the price of a regular construction that has the same size. With a surface of 2,000 sq. ft., this house combines the industrial design on the outside with a walnut finish on the inside. The floors are made of concrete and the dual-pane aluminum windows provide natural light all year round. The house has 5 separate decks to enjoy the sun while eating outside, tanning or simply standing still to enjoy the view. You would probably have to pay about $150,000-$200,000 (estimated) for a metal container house this big. Compared to the $300K required to build a normal house with the same dimension. We think metal containers sound quite attractive at this point. The costs to build this 1,000 sq. ft. house rise up to $40,000 – $80,000 (estimated). They used 2 x 40 ft. containers and added large windows to make the house look very spacious. This will get your mind off the fact that it’s made of metal containers. Although you can’t tell from this picture, the house is located near a 2-million people city: San Jose, Costa Rica. This is a great way to build the house of your dreams without burying yourself in debt. Any young married couple who bought a house agrees their life became a lot more difficult after getting a loan of $150K+, so why would you do the same when there is a more affordable way? You have to be open minded though about the whole shipping containers idea. 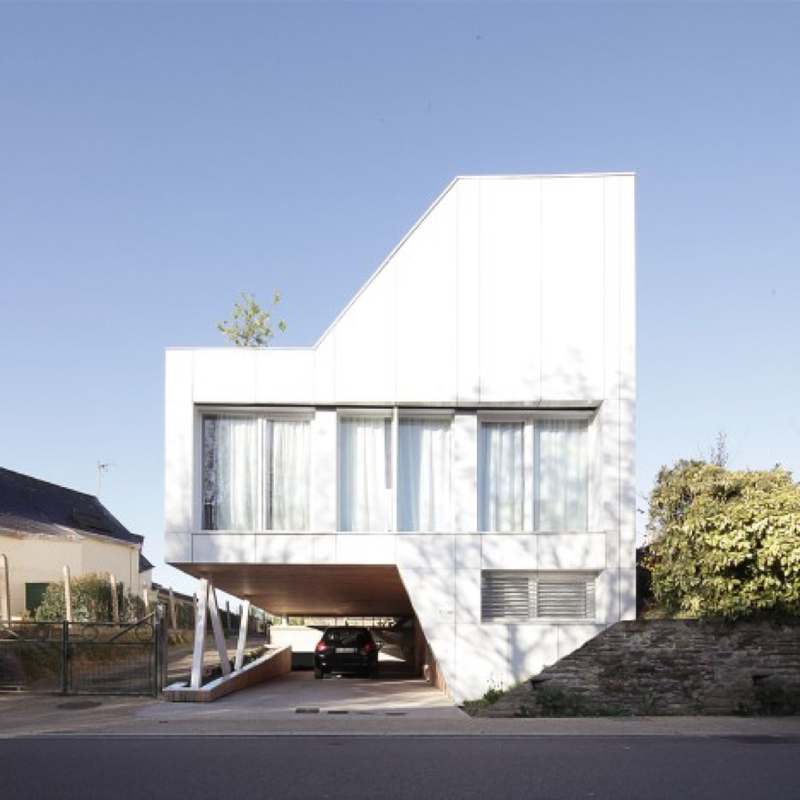 Located in France, this house measures 1,119 sq. ft. and is made of two metal containers positioned on top of each other. Maybe you don’t like the green color, but this is not a reason to dislike this design. Remember that you are free to paint it in whatever color you want. Besides, you have to appreciate the desire of architects to make the construction look as if it defies the laws of physics. Inside, you will see the house looks like any other one: wooden floor, white walls, and a comfortable sofa in the living room. If you go upstairs you will find the bedroom that has a door (or window, you can’t tell for sure from the picture) that leads to the top of the first container. You can put grass there or add a chaise lounge to get a tan during hot summer days. 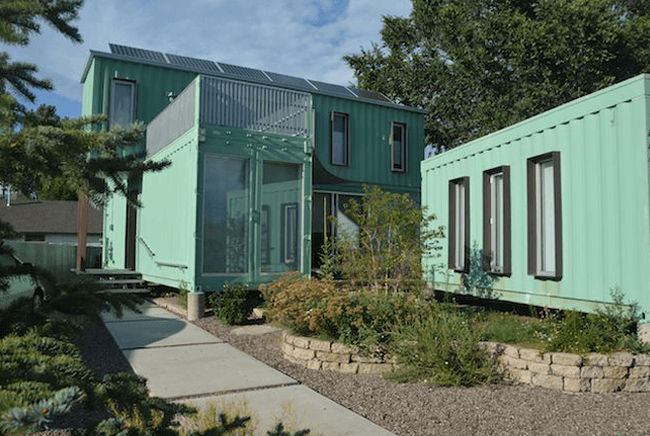 Here’s what a guy from Dallas, Texas, managed to build an impressive house comprised of 14 steel shipping containers for around $200,000 – $400,000 (estimated total cost to build). It has an impressive surface of 3,700 sq. ft., featuring 3 bedrooms, each with its own bathroom, a garage large enough to fit 2 cars, and a roof deck. There is also a study that the owner (who is an architect) probably uses for late night work. You must admit that the design is innovative. You can barely tell the walls are made of metal. On the other hand, your bank account would definitely tell if you were to build a regular 3,700 sq. ft. house with pool. The house below seems to be made of 6 metal containers put side by side near a river. You can’t see it in this picture but the construction has a greenfield on the top, which is another trend that becomes more and more popular. 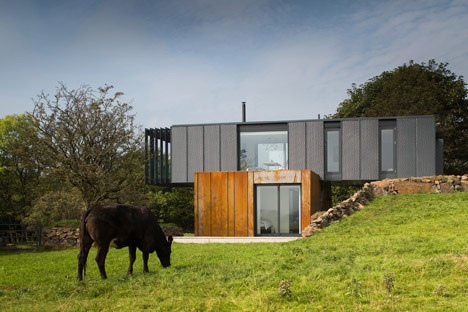 Located in Scotland, this container house hosted tourists from all over the world: Australia, America, Africa, Asia and Europe (even Eastern Europeans like Russians and Romanians afforded to stay a few nights – just kidding, people are not that poor in these areas as the West world tends to think). If you want to build one of these for yourself, you have to take into account the location. Some shores are not suitable for constructions and you will have to apply for a permit to find out if you can go ahead with the project. Don’t forget about a site plan: contact http://24hplans.com for more details. This house is basically made of 2 pieces separated by a small yard where you can install a patio and furniture. If you have pets and/or children this space is very useful. You will always be able to keep an eye on your kids just by glancing out the window. This design basically features two separate house, a situation perfect for a recently married couple who want to stay close to their parents. The floors are made of concrete and fir while the large panels made of glass are found on every side of the constructions. The entire property measures 1,920 sq. ft., the main building being made of 6 shipping containers. The owners wanted to direct attention away from the fact that the walls are made of metal and hid them behind drywalls so that the construction looks like any other house. 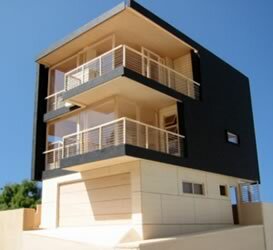 If you don’t see the exterior, you can never tell that the house is made of shipping containers. 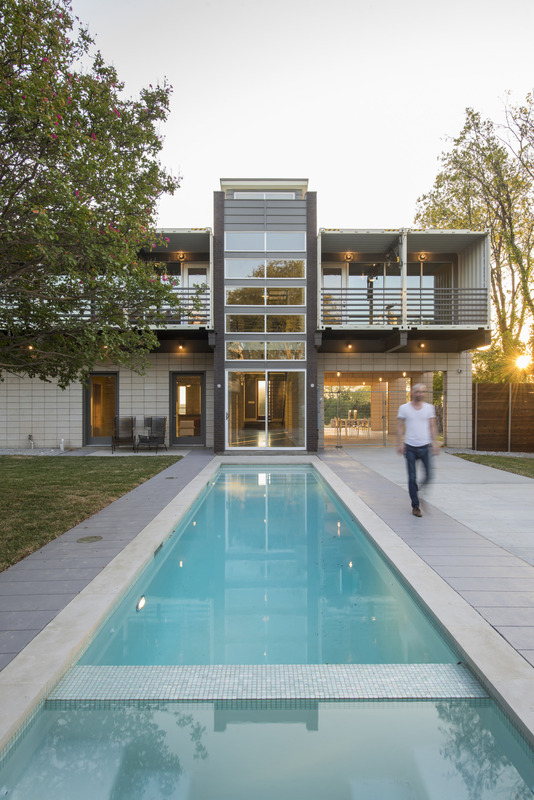 Made of two shipping containers and other materials, this house covers 1,517 sq. ft. of Nederland, Colorado. The main living space is inside the containers where you will find 2 bedrooms, a kitchen and a bathroom, an office and a laundry room. The house looks and actually is very spacious. The ground floor combines the living room with the kitchen in a beautiful open space design. You can install solar panels on the roof to make your own electricity. As you see, the house is located on a rocky hill where it can be hard to get electricity and running water but you will find a solution if you don’t want to live off grid as some of use would love to. Expect to pay around $40,000 including the costs for the solar panels. The façade is asymmetric having a parking space big enough to accommodate 2 SUVs. You will see this house in France tucked between a bunch of regular houses. One thing we can all agree to is that the house definitely stands out with all its angles. At a first glance, it doesn’t look to be made of shipping containers but if you look closer you will see it’s a metal modular home that fits a limited budget. 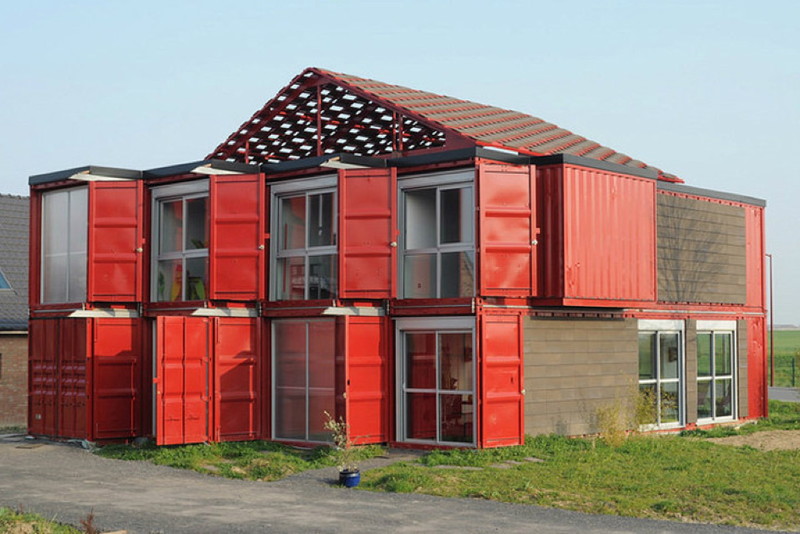 You have to contact a specialized company to turn the containers into living spaces by adding insulation, electrical wires and to make other necessary changes. Adjusting the containers off site and simply having them delivered to the location highly reduces the building time. For example, this particular design was built in only 3 months. Here’s a futuristic design that requires some extra investments. It’s not that easy to find workers who know how to implement the design, nor to find an architect to put it on paper. You need about 10 shipping containers, which means that the raw materials price starts at about $20,000 (at an average price of $2,000 per container). Obviously, the actual cost to design and build, with all the permitting, design, and interior finishes will likely put the total cost at well over $100K mark. The construction is actually a studio in Germany built in 2010 and represents the concept of a photographer named James Whitaker. The downside is there is no garage, but if you own enough land, you can park it nearby. The design allows plenty of natural light to get inside and its radial composition is definitely unique. This design is quite similar to the one featuring a green and a black container. The bars you see to the left of the construction actually make a balcony. The outer wall of the balcony is made of a short rectangle of glass. On top of the brown container, there is a deck surrounded by glass walls and a staircase that leads back to the ground meaning that you can reach the top floor directly from outside the house. The containers were assembled around a steel framework. When you go inside you will see a living space downstairs with a sofa in front of a metal fireplace. The indoor staircase is also made of metal and leads to the top floor where you find the master bedroom. Given its cross shape, this design can create a bit of controversy especially if you live in an area where the majority of population isn’t Christian. To me and many other people out there, this is just a house made of shipping containers positioned perpendicular to each other. It makes good use of vertical space and it definitely stands out. 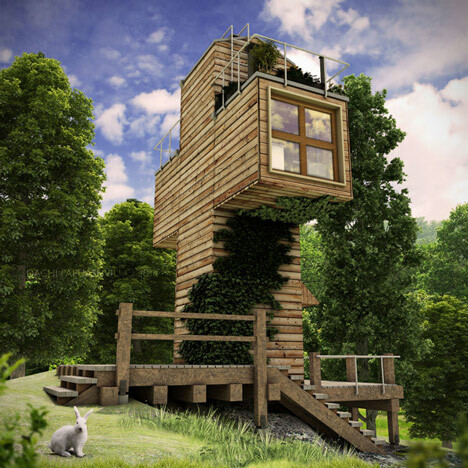 The concept revolves around self-sufficiency, so this would be an off grid house. It was actually designed as a skit for a single person. Using waste materials significantly reduces the costs. There actually are 4 levels in this house. From the ground up: the first is the lobby, the second is the bathroom, the third is represented by the horizontal container and holds the rooms and the kitchen while the fourth can be turned into a study with a door toward a deck on top of the horizontal container. 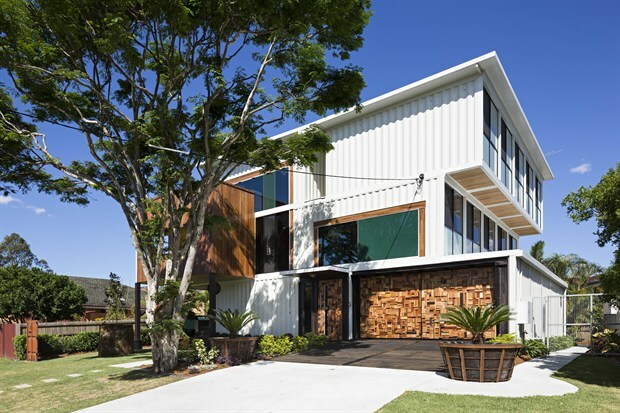 This design masks the metal with pallets giving the house an appearance suitable for a Jamaican beach. 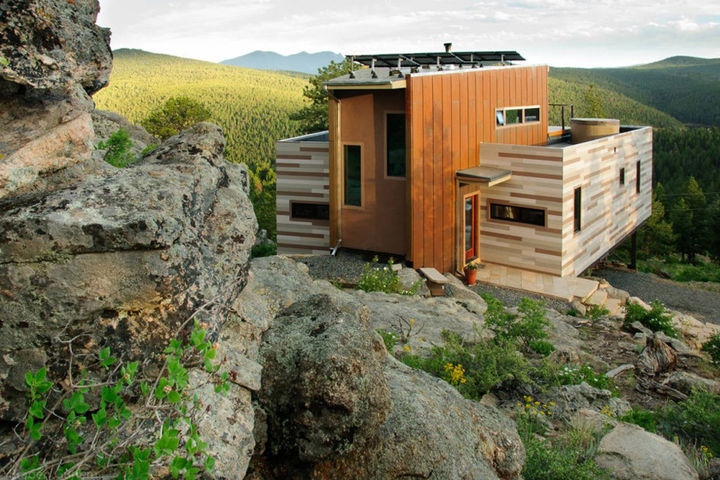 The house is eco-friendly, meaning it’s built with 85% recycled materials. Proper insulation eliminates the problem of condensation and maintains the right temperature during both summer and winter. Here’s a single container house with solar panels. If you do some smart planning, you can probably keep the costs under $50,000. You might think that buying a shipping container for a couple thousands dollars is all you have to do in order to obtain this house, but it’s a bit more complicated than this. The building is meant to accommodate a family of four and to supply it own energy. The deck allows you to eat breakfast outside if you buy some patio furniture. This house has a big sloped roof that you can cover with grass. The brown material you see in the picture is actually a bamboo lining that insulates that containers making them appropriate for human beings. Remember that it’s not just a container, it’s a construction that’s supposed to abide to certain regulations. That’s why you will need a permit and to make sure the house is not a fire hazard. The design seems a bit closed but you can open it up a bit by adding larger windows. This container house is a big one built with 40-footers. If you were to build a regular house that’s the same size, you’d do it in twice the time. This home is located in Costa Rica and is adjusted to withhold tropical weather. For example, you can apply a special type of paint that protects the container against frequent rain showers. 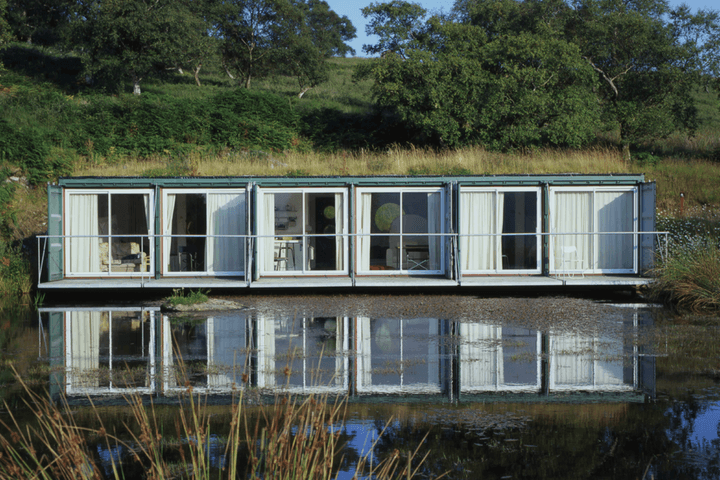 This design is perfect for areas where floods occur often because the ground floor containers are flood proof. They also resist wind speeds up to 175 mph. The weight capability of these containers is quite amazing. You can stack as much as 7 containers on top of one another, meaning that the base container holds close to 200 tons (each container holds up to 30 tons of weight). This house covers at least 2000 sq. ft. and has a big garage that can fit 2 cars. If you want to keep the costs to a minimum, this is the design you want. You need to buy only 1 container and then make the necessary changes. For example, the one in the image is coated with treated lumber to give it a more natural appearance. However, this is not a good idea for houses in rainy areas because wood rapidly deteriorates in contact with water. Here’s a gorgeous house with 2 stories off the ground house with a big garage. Whoever designed it did a pretty great job concealing the fact that it’s made of shipping containers. Note how the black combines with the white creating a modern look. The bars of the balconies are designed to allow you to see the view without standing up. For example, you sit on a comfortable chair to drink your coffee in the morning and you see everything as if you were standing because the bars are thin enough to provide a clear view. And last, here’s is a computer generated design of a house that offers plenty of outdoor space. Notice how you can get to the roof directly from the ground. The house measures 1280 sq. ft. and about 9660 sq. ft. are made of patio or deck space. Notice that on the side of the roof there are solar panels to make the house self sufficient. With proper sourcing and planning, you should pay no more than $75,000 – $125,000 (estimated) for the entire construction including PV solar panels. Not bad for a house this big, isn’t it? Shipping container houses are significantly cheaper to build than regular homes. They are very resource efficient and can be made to look like regular houses. You will need a building permit to build or install a container house, and you’ll likely need a site plan to obtain the building permit.